Being a woman comes with its own added advantage and perks of emotions and mood swings. Perhaps, this is why they say, Women should come with a disclaimer, “handle with care”. Women and emotions have a long history and apparently, it’s going to have an ultimate future as well. Women are very emotional beings and sometimes these emotions get a little too unnerving to handle. Although, there isn’t anything wrong in being emotional, it is recommended to have an understanding of own emotions and moods, so as to avoid the hurricane of emotions. So, have you been feeling very emotional lately? These Seven reasons that can likely be the cause behind your out-of-control emotions. Read on to find out what can be done in order to fix them. Are you taking too much work pressure? Was there a sudden mishap? Some issues in family are taking a toll on you? Whatever be the case, make sure to identify the sources of stress and rank each in order to determine the greater sources of stress, so as to avoid emotional issues. Once you have identified the sources, start looking for healthy ways to manage stress. Studies reveal that exercise is a good means for overcoming stress. Avoid indulging in stressful circumstances, and if it’s inevitable, then work on taking charge of your feelings. During the process of growth, our bodies go through several changes, such as the variation in the hormonal levels. In case of women, drop in estrogen levels can result in changes in emotional behaviors, however, for men, the fluctuation of testosterone levels can trigger a mood change. Suddenly everything appears to be irritating and anger becomes your favorite reaction? Well, it’s perhaps, PMT! Your periods may be due. During periods, the emotions are magnified as there is a whole lot of Uterus saga going on. Therefore, most women suffer from heavy emotions at this time. Are you suffering from insomnia? Or do you love to sleep late at night always? Deficiency of sleep can interfere with the body’s functioning and make you cranky. This can result in triggering your emotions and making them vulnerable. Therefore, the best way is to make time for sleep. The average adult should have seven to nine hours of sleep each day. The foods we eat can have a deep effect on our moods. A delectable bite of chocolate can not only result in a rush of sugar, but endorphins (the happy hormones). The body rewards you for the goof food, but also punishes you for the bad, which might have lead to you feeling emotional lately. Quick Tip: Plan for a balanced diet and do not skip your breakfast. Millions of people around the Globe suffer from the various forms of depression. According to statistics, around 80 percent of people who suffer from clinical depression do not get any treatment. In fact, it is possible to be depressed and not know it. This can be the reason you feel emotional lately. Therefore, it’s crucial to not ignore the symptoms and take steps to treat the depression. Having issues in your marriage? Are you tired of complaining to him? He doesn’t seem to be attracted to you anymore? Relationships aren’t an easy journey. The emotions don’t stay the same forever. These issues can take a serious toll on your mental health and result in you feeling more emotional. 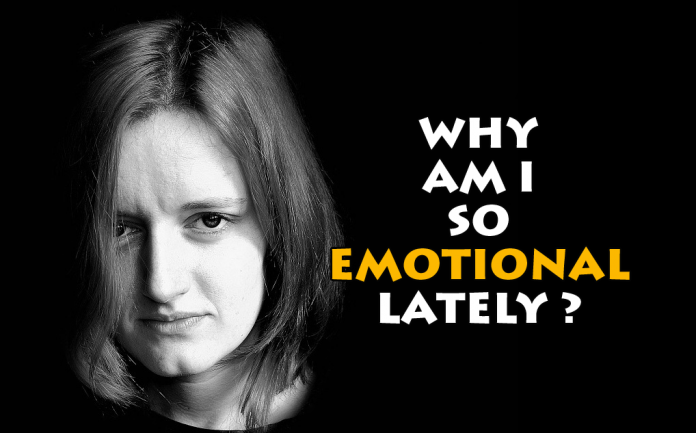 These are the common reasons behind the emotions getting flooded. Do you too feel you get moody and emotional? What do you do to help keep calm? Share in the comments below.